All you need is tulle in the color of your choice, wire, wire snips, 4x6 card stock or index card and ribbon. Just snip your wire into about 4 inch pieces and measure your tulle into 90" pieces. After your tulle is cut you are going to wrap it around your card stock. Gently pull it off the paper and wrap your wire around the center of the tulle. It will leave you with something that looks like a little bow tie. Take your scissors and cut the top and cut the bottom to reveal the layers of tulle. Then you will simply pull the tulle pieces apart and "fluff" it to create a pom. Awesome! I've been wondering how people make the tulle poms, and this makes so much sense I don't know why I didn't realize it. It's a lot like making a tissue paper pom mixed in with making a tutu, lol. So Cute...I just have to do these!! Love this! Think I will be making these for my nieces ballerina themed bday party:D But you said 90 inches of tulle? Is that a typo or am I misunderstanding:S How wide...seeing that you have different widths of tulle spool in the image? Hi Maysem thanks! 90 inches is correct, the width is just whatever width your tulle comes in. In the photo the larger roll of tulle just makes a larger pom. Let us know if you have any other questions, we are glad to help! oooh..ok! Silly me, I'm thinking 90 yards as I read that :P That makes sense when it's read correctly...LOL! Thanks! 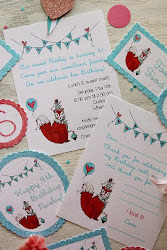 I am making a mental note of this post for Amelia's 3rd birthday party! I am so glad you shared this! it is exactly what i am searching for !!! look fantastic & cute !! I can't wait to see the rest of the party! 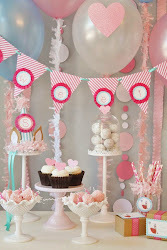 cause i am going to make this pom pom theme for my daughter's 1 st birthday . could you please put the photos of the party asap i need an ideas for the decoration.. Awesome work and idea.........love all those colors!!! !So nice!!! I was wondering if you could give instruction on your you hung them? Meaning how did you attach them to the string (if that's is string) and how you attached them to the ceiling or wall? Thanks! Very pretty. I will make tulle pompom headbands for my granddaughter. Do you have the instructions on how to hung them? How did you attached them to the string? I'd like to know as well as Karem...how did you attach them to the string? The folding process is very easy, just simply wrap the tulle around the paper as described and then gently pull it off and from there you will tie the wire around the center. hope this helps! How many yards is 90 inches? Im new to this but i love tulle. I really want to make some of these for my daughters 3rd birthday! Please help. How much tulle do i need for prob 10-12 pom poms?